There is much to be seen from the windows of a subway train that glides above the ground. Hidden gems that might never otherwise be seen are only discovered because of a commute. 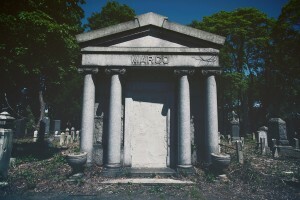 Such is the case of Bayside Cemetery which can be seen off the A train in Queens, New York. As one of the oldest Jewish cemeteries in New York City, with tombstones dating back to the Civil War, Bayside Cemetery is hidden among overgrown trees and weeds; an occurrence that can be found amongst many cemeteries around the world, across all religions. Founded in 1865, it has been subjected to neglect and lost sight of, yet the fact that it is not acutely manicured is precisely why it makes for such an interesting and mysterious journey into what lies beneath, an uncovering of its history and the stories of the ones left behind. After failed volunteer attempts to revive the forgotten landmark, which according to The New York Times were partially discouraged because of the lack of interest showcased by part owner Congregation Shaare Zedek, a synagogue in the Upper West Side, the cemetery currently stands unkempt and wild like a twisting vine in the tropical rainforests, growing a second life. Showcasing the neglected New York cemetery, comes a photo story on the beauty found in death and decay as a second life comes to being (whether metaphorically or through the nature surrounding it), showcasing that places like this should never be forgotten as they are rich in artistry, personal stories and history, waiting to be once again discovered and retold. Photos and narration by Marianna Jamadi with video editing by Olga Zapisek and music “Relent” by Kevin MacLeod. It is recommended to view this photo story in full screen.